"It may be confidently asserted that the characters of the six breeds which have been figured are not in the least exaggerated." - Charles Darwin, Variation in Animals and Plants Under Domestication. Pigeons show a staggering amount of variation within a single species. In fact, as Charles Darwin noted, the striking differences between different breeds within this species approaches the magnitude of differences usually seen between completely different species of birds. 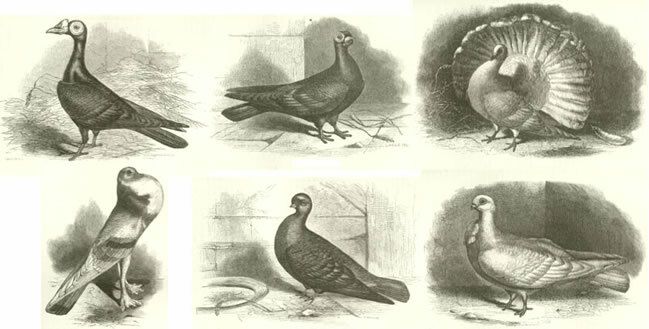 Ever since the time pigeons were domesticated thousands of years ago, breeders have selected for dramatic differences in many traits, resulting in well over 300 recognized breeds today. We are interested in learning more about the genes that control color diversity in pigeons, as well as other differences in skeletal structure, physiology, and behavior. We will do this by using genetic techniques that are similar to the methods used in humans to track down the genes responsible for susceptibility to cancers and other genetic diseases. We are grateful to pigeon breeders from around the world who have donated feather samples for this study. At this time, we have a sufficient number of DNA samples to complete the first phase of the study and we no longer require additional feather submissions. We hope this study will benefit the pigeon hobbyist community as well. Our work will us help understand the history of different breeds, and potentially allow genetic testing for relationships among individual birds and breeds. In January 2010, the Utah Pigeon Club hosted the NPA Grand National in Salt Lake City. We attended this show and provided updates on our project and answered questions from many of the hobbyists who have provided samples to us. We also attend the annual Utah Premier Show to share results and answer questions. If you have any additional questions, please feel free to contact us by email or by phone (see below). Please click here if you would like to make a donation to our research efforts using the University of Utah Development site. This process involves a few simple steps and takes only a few minutes. You may also contact us directly. All contributions are tax detuctible and the University will provide tax receipts. Thank you for your support! Paul Gamino - "America's Premier Parlor Roller Loft"